Courtesy photo Shown from left are Scholarship Chair Todd Myrick, winners Addam Claes, Luke LaFave, Mark Maeder, Cassandra Krenek and Kaitlyn LaChapelle with Club President Jeff Slagstad. Not pictured was scholarship winner Laura Hallfrisch. 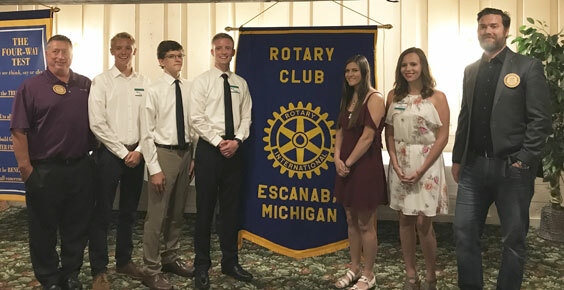 ESCANABA — The Escanaba Rotary Club, and its affiliated Rotary Trust, awarded six college scholarships, valued at up to $14,000 to recent Escanaba and Gladstone High School graduates at its annual dinner meeting Tuesday evening. The meeting was held at the Freshwater Tavern at the Terrace Bay Hotel. Addam M. Claes – Claes is an Escanaba Area High School (EAHS) graduate who plans to attend Central Michigan University in the Fall. His planned major is Environmental Science. While in high school he was a YMCA swim instructor and life guard, and worked for the Gladstone Parks and Recreation Department. Extracurricular activities included the National Honor Society (NHS), Student Council, Mo’ Buddies, basketball, football, chorale and tennis. Cassandra M. Krenek – Krenek also graduated from EAHS and plans to attend Bay College and then Lake Superior State University, majoring in Fisheries and Wildlife. 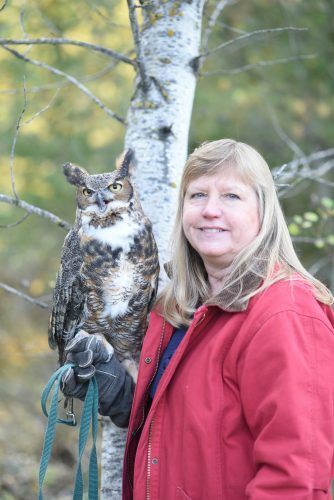 She has worked at Superior Ice, the Pellegrini Strawberry Farm and the Grounds Nursery. Cassandra participated in volleyball, cross country and wrestling. She is also a member of the NHS, has coached youth wrestling, been a student of the week three times, and was involved with Big Brothers/Big Sisters (BB/BS) and 4H. Laura M. Hallfrisch – Hallfrisch graduated last month from the Gladstone Area High School and plans to attend the University of Mary in Bismark, ND. Laura plans to major in Communication Disorders. She has worked for Delta Floral and Gifts and been a babysitter. While in school she also was a member of the NHS, Drama Club (including a lead role), Science Olympiad, Youth Encounter, Challenge Youth Ministry, the Honduras Mission and the Amata Bianca Prayer Group. Luke M. LaFave – LaFave also graduated from Escanaba last month and the University of Michigan. He plans to major in Aerospace Engineering/Mathematics. Luke has worked for a local CPA and Basic Marine, Inc. Luke participated in cross country the Quiz Bowl, NHS, Escanaba Catholic Faith Foundation, BB/BS, the Chess Club, Book Club and the UP Math Challenge. Additionally, the trust board awarded its annual scholarship valued at up to $4,000 to Kaitlyn LaChapelle, a recent Gladstone graduate. Kaitlyn plans to attend Bay College before completing a degree in Secondary Education at Northern Michigan University (NMU). The Rock resident was a member of the High Honor Roll, was a teacher’s aide and served as a mentor while at GHS. The Trust Board awarded the inaugural Leon E. Kinasiewicz, MD scholarship to Mark M. Maeder, a recent EAHS graduate, who lives in Gladstone. Mark plans to attend Central Michigan University, majoring in biology, before becoming a Physician’s Assistant. He is also a member of the NHS and has participated in the NMU Math Competition, Health Occupations of America, track, football and Mo’ Buddies. Additionally, Mark has volunteered for Toys for Tots, visited nursing homes, helped with the Community Thanksgiving Dinner and been a YMCA lifeguard. The Kinasiewicz Scholarship is valued at up to $6,000. Dr. Kinasiewicz is a board certified radiologist, long time Escanaba Rotary Club (past president) and Trust Board member. He is a two-time Paul Harris Fellow and veteran of the United States Air Force. He intends to annually provide scholarship assistance to a young person who plans to enter the health profession and has overcome adversity, and may be a late bloomer. Rotary of Escanaba is an affiliate of Rotary International. The Rotary motto is: Service above Self. “These young people have shown their desire to serve,” noted Club President Jeff Slagstad. For more information on Escanaba Rotary, check our web page at www.escanabarotary.org or on Facebook @Escanaba Rotary.